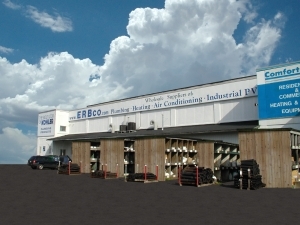 Erb Company's tradition of supplying excellence and expertise to WNY plumbing and HVAC needs goes back over 100 years. Initially, George Erb founded the organization in the early 1900's as a provider of irrigation piping supplies to local farmers. Over the next few decades, the company continued to grow and thrive, remaining family-owned and run for 4 generations. For Larry Erb, whose leadership for over 40 years has seen the company through changes of all kinds, the philosophy of Erb Company boils down to the importance of the quality of the relationship that is forged when doing business with valued customers. Now, Erb Company has evolved into a leading wholesaler in the area, supplying a huge variety of plumbing and heating supplies, pipes, valves, fittings, underground products, and waterworks. Larry passed away in 2013, with his son Allen taking the helm. Allen Erb embraces the traditional values that have built the company's success, but prepares for the future by bringing in relevant new ideas and technologies.